The wine region of Somló, to the north west of Lake Balaton, covers 832 hectares, largely divided into many small estates, producing exclusively white wines, primarily made from Juhfark, Olaszrizling, Hárslevelű and Furmint. Károly Kolonics produces wines which are both traditional and more innovative. In the cellar he allows the terroir and fruit to express themselves through spontaneous fermentation and careful use of wood, using acacia and large old oak barrels, which never overwhelm the fruit, but intriguingly enhances different aspects of the grapes character. 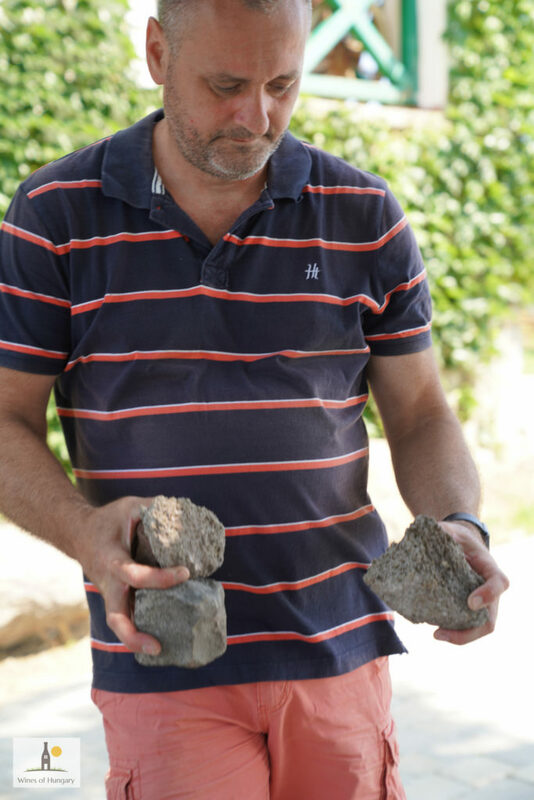 Volcanic soils can dominate the wines, often creating severe and austere wine, but Kolonics manages to use this mineral character to support the fruit, not dominate. Since his first vintage in 2001, his wines have shown great concentration of fruit and structure combined with elegance and ageing potential. Károly Kolonics combined with elegance and ageing potential. Juhfark, is not an easy variety in my opinion, but Kolonics crafts a beautifully structured wine, with potential to mature and develop over the next ten years, if not longer. Acacia emphasises the ripe fruit, with classic creamy lemony fruit in youth, developing, with age, floral, honeyed notes whilst retaining its high lemony mineral acidity. Furmint, a neutral variety, allows both expression of terroir and winemaking skills. Kolonics manages to extract fresh melon, lemon, honey and thyme balanced by the bone dry, mineral, austere character of the volcanic soil. The warm 2017 vintage has amazing lime fruit, almost an adult version of lime cordial. Hárslevelű, with its fragrant lime flower perfume, is often the second fiddle to Furmint. Here, the steely, salty edge picked up from the volcanic soil to give power to the pretty fruit and the potential to age, developing glorious waxy, honeyed fruit and lemon curd acidity after 10 years ageing. Kolonics believes Olaszrizling can be a classic variety (and I must admit I agree with him). By macerating the berries from 6 to 12 hours for greater concentration, the wine has creamy apple and lemon fruit. With age, the wines develop honeyed fruit with complex beeswax and rich dried fruit notes, counterbalanced by long, salty-lemon mineral acidity. Károly’s wines are available at the Wine Society. Be quick, they always sell out fast!